Got the cloth and epoxy on the port side today. The temp was in the low 80's which makes for a better epoxy day. We will be moving our daughter to Pittsburg this weekend to start 4 more years of college. She will be a dentist when she gets done there. It will be a week or two before I get much done on the boat. 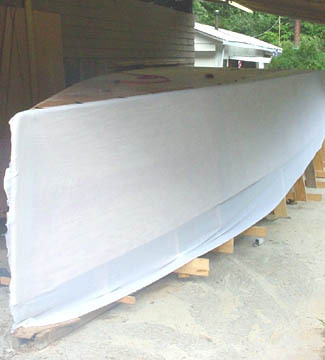 Finished putting the cloth on the hull this weekend. 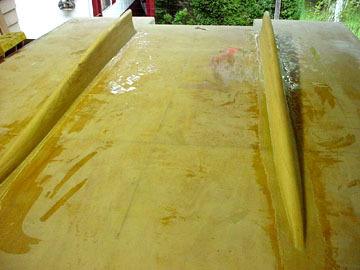 You can see the picture below without the epoxy applied yet. The xynole has been nice to work with. 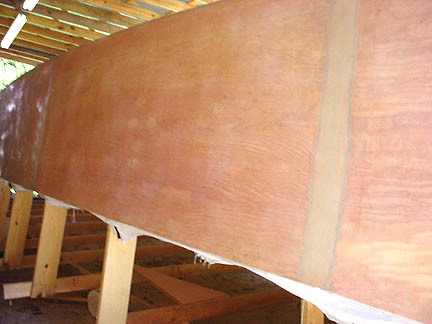 It doesn't have any of the itch that is associated with fiberglass cloth and is stronger also. Washed the whole boat Sunday to get the amine blush off from the epoxy so as not to have any problems with the rest of the epoxy work. It's a good feeling to know that I could put it in the water and it would float at this point. It rained 4" Saturday night in Hickory and I was thinking.........lots of rain, boat on top of a mountain.......................sounds familar. Now where did I put that pair of animals?? We had a wonderful family reunion this weekend with 72 in attendance. Found some old pictures of my Grandfather's 36' wooden power boat. Seems they did a family trip from Ohio to South Florida in the 1940's before it was a popular (and easy) trip. I guess I have inherited this wooden boat bug. 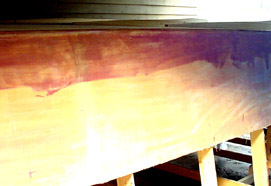 We did a little sanding and finished taping the port chine a second time. 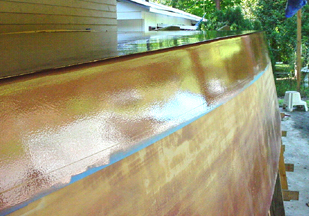 We also got the third coat of epoxy on the port side. I put a second layer of xynole on the bottom bow section about 4 feet back from the stem for added protection since this will be the first thing to hit the beach. More sanding to be done this week. Spent the weekend getting the skegs glued up but I'm not happy with the result and may remake them this week. You can see in the picture where I set them on the hull to see how they look. 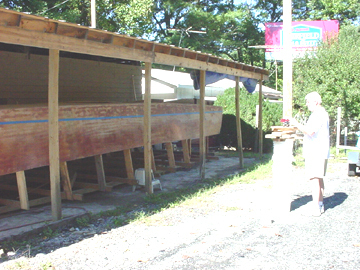 I think I will beef them up a bit just in case the boat has to sit on them when it dries out. We also put on the epoxy/microballoon mixture to fair the hull. The bottom is almost completly sanded and ready for the bottom paint. Finally got the skegs on the bottom of the hull. We spent the weekend sanding, again. The skegs turned out better than I expected. I'm good with right angles and such but the skegs are more abstract. Get one like you want and then try to make the other one look the same. If the second one looks better then you rework the first one to look like the second one, and so on........ I think they are almost the same now. 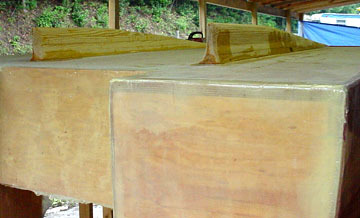 Because the boat will sit on them at low tide I made them very sturdy. 2x10 yellow pine, ripped and stack laminated worked fine. I lack a little sanding and they will be ready to bottom paint. Check out the pictures on this page. Marking the waterline with the laser level.